• How To Win The College World Series: Ray Tanner (South Carolina), Andy Lopez (Arizona) and John Savage (UCLA) discuss all facets. • CB’s National Player Of The Year: LHP/1B A.J. Reed of Kentucky puts up monster numbers during 2014 season. 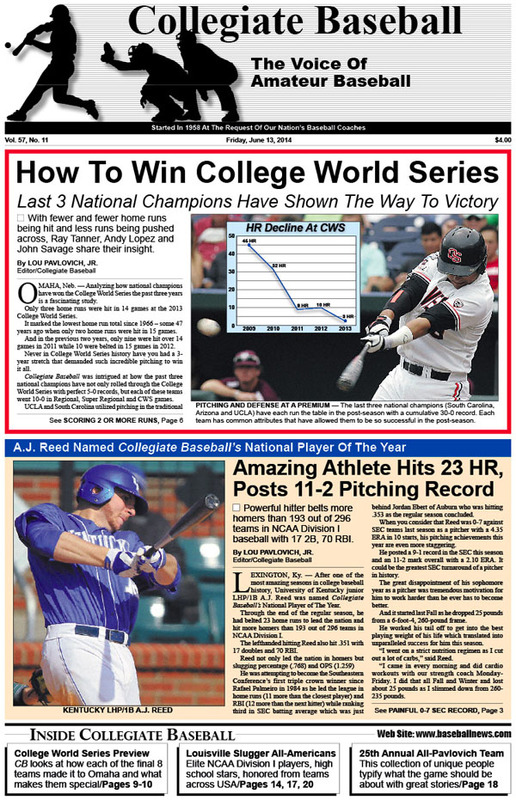 • College World Series Preview: CB looks at how each of the final 8 teams made it to Omaha and what makes them special. • Louisville Slugger NCAA Division I All-Americans. • Louisville Slugger Freshmen All-Americans. • Louisville Slugger H.S. All-Americans. • 25th Annual All-Pavlovich Team: Collection of unique people are presented for 2014, including most inspirational player Cory Hahn of Arizona State who was paralyzed from chest down in head first sliding accident. • Jacoby Ellsbury commits $1 million to Oregon State’s baseball program. • Editorial: More home runs will add sizzle to game when flat seam balls are utilized in 2015. • Dan Blewett: Flat seam balls will be incredibly difficult to grip in cold weather. • Charlie Greene: Elbow surgery epidemic merits in-depth study. • Collegiate Baseball’s National High School Poll: Lambert H.S. (Ga.) rolls along with 36-2 record. • NCAA Division 2 Championship: Southern Indiana captured second national title. • NCAA Division 3 World Series: Wisconsin-Whitewater wins second championship with 7-0 win over Emory. • NAIA World Series: Cumberland captures its third national title with 3-0 win over Lewis-Clark State. • NJCAA Division I Championship: Iowa Western wins third national title in five years with huge offensive showing. • NJCAA Division 2 World Series: Mesa captures fourth national championship with 11-inning victory over Hinds. • NJCAA Division 3 World Series: Tyler (Tx.) picks up second title with 6-3 win over Cumberland County (N.J.). • California J.C. Championship: Orange Coast captures 5th state championship, 5-3 over San Joaquin Delta College. To order the June 3, 2014 edition of Collegiate Baseball or subscribe, CLICK HERE.